K + J Wedding at The Triton Museum Of Art — Penny & Co.
Kate & Junnman’s wedding goes down as one of my favorites of 2018. 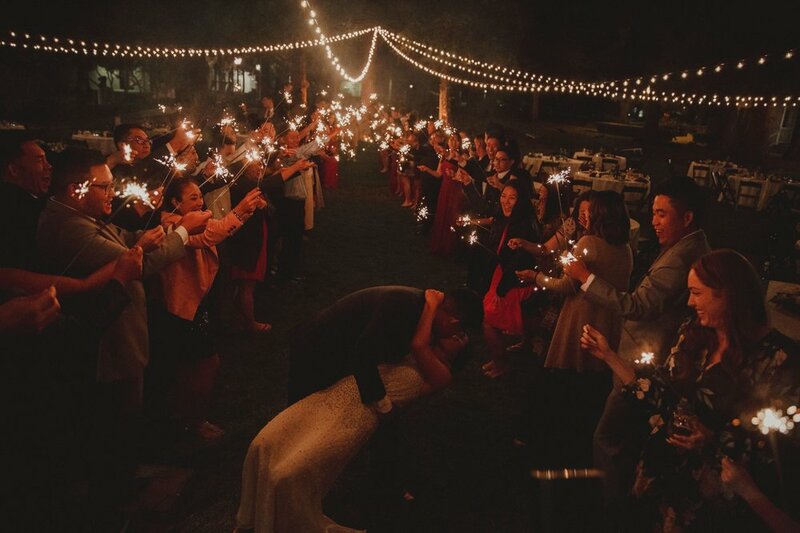 They had all the elements that make a great celebration, a live band, food trucks, a vintage trailer photo booth and most importantly, friends and family who were stoked to celebrate their marriage! Kate and Junnman got married in a gorgeous church walking distance to the Triton Museum of Art which is where the reception was held. After church the party began, the live band was playing sultry jazzy tunes while guests were invited to feast. On one side was a Southern BBQ food truck and the other a Korean BBQ Buffet. I opted for the Korean BBQ Buffet and was so stoked to build my own bowl and that I could make it Vegan! For dessert not only was there a dessert bar but also a Gelato Truck. After their friends and family indulged in all the culinary options the bride and groom began their first dance, this is where my heart melted. When the first dance ended the groom grabbed the microphone and I thought he was going to do a toast, even better, he signaled the band the play a tune. The song was Stand By Me and he sung to Kate as all their friends and family smiled, shed tears and slow clapped along. At this point even I was crying, the love between these too was so apparent. After the band was done playing the party didn’t stop, an I-pod took over the speakers and a dance party commenced. It was at this point of the night that Penny, our vintage camper photo booth broke the record of people inside. A previous record of 16 was shattered with 20 guests squeezing inside the photo booth. It was seriously such a fun night. Check out the photos below and the vendors that made it all possible. Vendor Dream Team// Venue: Triton Art Museum // Photography: Brad and Rachel // // Food: Smoked Out BBQ, Sticks n' Greens , Hom Kitchen //Ice Cream Truck: Treatbot // Tarts/Cake: Whole Foods // Pie Pops: Cake Walk Dessert // Rentals: A Party Place // Reception Music: Citizens Music // Vintage Camper Photo Booth: Penny and Co.